Bowker reported last week that 12% of the ebooks being bought now are self-published. There was skepticism about the methodology from The Digital Reader and Good e-Reader says Bowker’s data should be taken “with a grain of salt”. But the exact number doesn’t matter; the trend does. 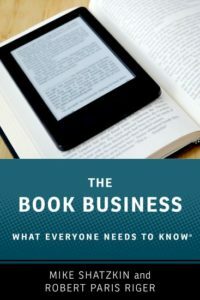 The share of the consumer ebook dollar going to books that aren’t coming from publishing entities means that the new Big Six for ebooks are the ones we know well — Penguin Random House and the four (HarperCollins, Hachette, Simon & Schuster, and Macmillan) that among them add up to about their size — plus Anybody Press. And Anybody Press is almost certainly growing faster in ebook sales than any of the other Big Six. This is happening almost solely with individual authors and still mostly with authors who are not in demand by the commercial publishers. Although it does happen that authors turn down their next deal to self- or unconventionally-publish (which publishing with an Amazon imprint, even under advance-against-royalty terms, still is because there’s to date no effective retail distribution), it’s still rare for that to happen. The self-publishing or Amazon-publishing route still requires pretty much giving up on bookstore or other retail distribution. (Or so it has seemed. The news that Amazon has sold a million of “The Hangman’s Daughter”, an unknown number through the paperback licensed to Houghton Harcourt, may be contradicting that notion. Except we don’t know how many Houghton Harcourt has sold.) But the ebook royalties are higher, so it is a balance that deserves, and gets, constant review by agents and authors as the share of sales through bookstore or other retail distribution continues to decline. If I were the business development manager for Anybody Press (and, on some consulting projects we are working on, I am) I would see lots of target markets for growth. I’d encourage my targets to keep doing the calculation of what the sales times royalty rate is for the “bought online” portion of the market versus what the sales times royalty rate is for a conventional deal that gets you the “whole” market. As the “bought online” share grows, more and more genres and authors will find that giving up the retail sale in favor of a bigger share of the revenue per sale online is to their financial benefit. And the way things are developing — “Hangman’s Daughter” aside — you might not have to give up the store sale forever. The “Wool” deal, where Hugh Howey sold only print rights to Simon & Schuster, hasn’t really been replicated yet for anything else that big, but it will be. (Successful indie authors John Locke and Bella Andre have done different versions of the same trick.) Royalty rates on ebooks from big publishers are bound to go up (while royalty rates for print books will probably go down). These will change the details of the calculations as they transpire. Another way to make the jump from purely online sales to a publication strategy that includes print in stores is to use print-on-demand technology from Ingram’s Lightning Source. That’s how Open Road, which began life as an opportunistic ebook-only publisher, has chosen to manage print beyond Amazon. As has Byliner. (You can always deliver print with Amazon by working through their CreateSpace capability.) Now, that’s not the same as being published with an advance sale in the stores on pub date, but it does mean that if somebody walks into a Barnes & Noble or an indie bookstores and asks for your book, they’ll be able to order it for delivery in a day or two. So aside from the market share fight big publishers will have with each other, there’s going to be a continuing market share fight between Anybody Press and the commercial industry. And for some time to come, Anybody Press is going to be winning. The question, like the question about online (and Amazon) market share growth is: where does it stop? Big publishers do have ways to fight back. Putting together our upcoming (September 26) Marketing Conference with Peter McCarthy, who used to plot digital marketing strategy for Random House, I’m learning what can be accomplished when scaled technology and expertise are employed by engaged title-and-audience knowledge. And, particularly viewed in a global context and aside from straight narrative books, the print-at-retail component has a long way to go before it becomes irrelevant. But when I say that, I mean “many years”, not “many decades”. This amorphous but growing competition is the “atomization” concept I wrote about recently in action. It can’t be neglected in the consideration of any branch of publishing’s future. In fact, indie entities, which is the way I think about atomization, are more likely to be disruptive on a larger scale than indie authors have been so far. So we might have Any Organization Press growing even faster in the next few years than Anybody Press has for the past few. What people spend for books won’t necessarily shrink drastically, but where the money goes will shift drastically. The challenge for today’s leading revenue producers will be to find the ways their business models can adapt to the shift.